It is beginning to look like Clinical Commissioning Groups are on the way out, the only question is how long this will take. A key document (pages 29 to 37) is the 2017 Next Steps on the FYFV. It flags up the significant drive to create sub regional structures at a high speed using a mixture of financial incentives, creating voluntary pilot sites and through inviting local leaders to head up these initiatives. The Next Steps report also flags up the creation of “accountable care systems” as a precursor to establishing “accountable care organisations” (see this BMJ 2018;360:k343 infographic) at a local level – bringing together providers and commissioners into one organisation. Although there is no legislation for any of this; change has been made easier by existing flexibilities with regard to pooling budgets and austerity policies have meant that local organisations are increasingly compliant and willing to accept change if it offers the chance of additional funding. In a very brief period of time we have been through – Sustainability and Transformation Plans which quickly led to the creation of partnership structures – initially called Accountable Care Systems through to their current iteration – Integrated Care Systems. Some of the rationale for this feels sensible – it marks a move away from the purchaser/provider split created by the 1991 John Major Government and recognises that the artificial divide between the NHS and Local Government is unhelpful and inefficient. Implementation has been rapid – NHS England already has a performance dashboard for first phase Integrated Care Systems. Its all a bit confusing. Even though there has been no legislative change to create these new structures we now have new subregional (Integrated Care System) and local (Accountable Care System) boards but all the existing Governing Bodies (hospital trusts, clinical commissioning groups, local authorities) are still legally responsible for the decisions. 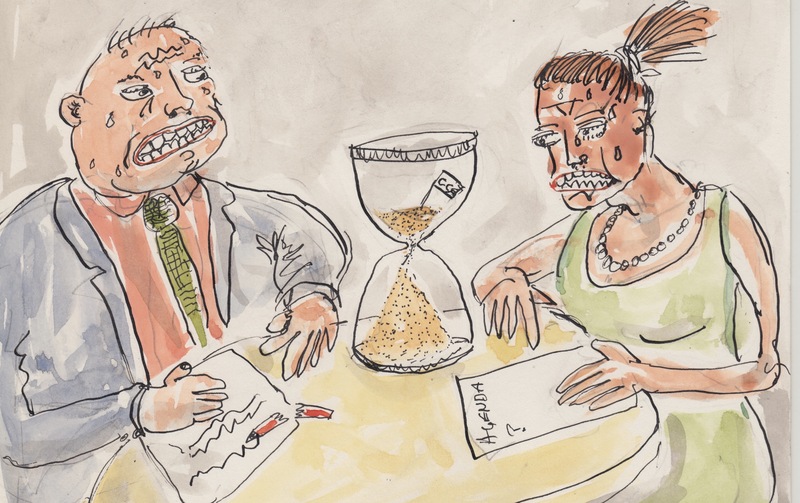 At a sub regional level this means that comparatively obscure local structures such as Joint Overview and Scrutiny Committees have to do their best to hold these new structures to account – with no additional resource. So, at a time when the health and care system is creaking at the seams with real delivery problems we are double running two systems – one that is legally responsible and another shadow system (with most of the same players) where decisions are made……and then have to be ratified by the legal bodies. This means that senior managers in the health and care system are spending time creating the new systems and running the current one. Of course NHSE has had to find new funding to employ them to do this. Understanding the finances is hard – but I think that the South Yorkshire and Bassetlaw ICS has access to £7m transformation funding (see page 7 of this report). 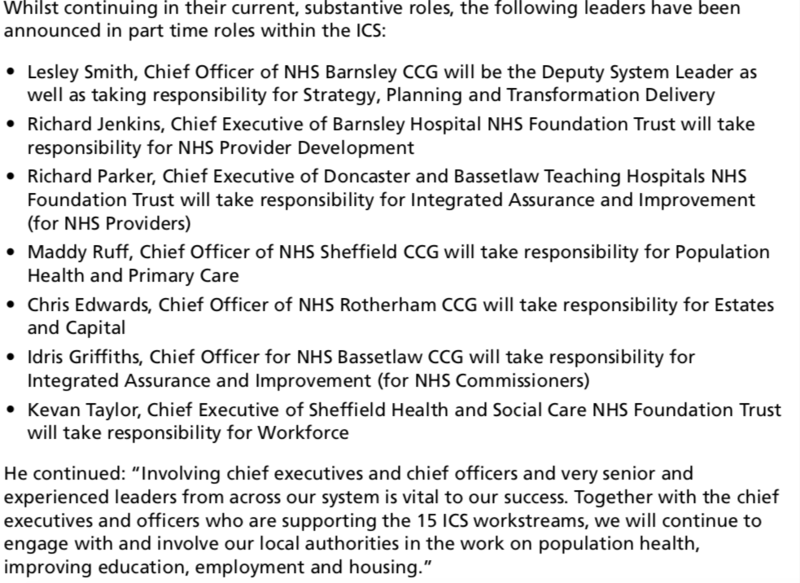 This probably means that NHS England has invested about £90m in the 14 different ICS sites agreed so far. 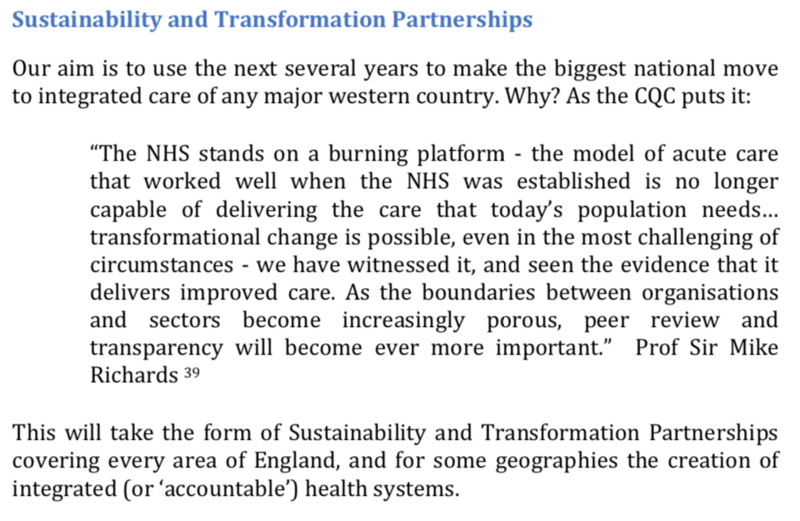 I think that this money comes from an allocation that NHSE has for transformation (page 7 again). See table below. Its not just the resource – as is often the case when new structures are created in the first phase the main players are the managers. The reason usually given is because of the need to get on with quickly creating the new system. This leads to a bit of a paradox. Despite a genuine desire to break the mould the new structures end up looking very much like the old ones – and I think this means that behaviours, priorities and actions do so too. While representation is important we need to go further if we are to have a dialogue that produces a different way of working locally. More investment has to go in to voluntary sector infrastructure so they can bring their expertise and challenge to the table and serious consideration needs to be given to strong elected and lay member involvement. I do think that they need to dig out some funding to strengthen the voluntary sector voice in this new world. Despite the ambition the approach at a sub regional level already feels a bit like the old Strategic Health Authorities with an emphasis on structures dominated by NHS managers and performance management systems that look up to NHS England rather than down to local health systems. Meanwhile, locally the direction of travel appears to be a greater focus on Accountable Care Organisations as this clear July 2018 report from the House of Commons Library explains. ← Are we being too smug about the NHS at 70? Why aren’t we celebrating the abolition of the Poor Law? That, frankly, is a pretty good overview of what has been happening in Manchester, an immense amount of time has been spent onc reating new structures with really no benefit so far for patients. It’s all jam tomorrow. Once more, a very good and soundly discussed message. However, should we change direction and stop focusing on how much more, or less, should the Community and Voluntary sector be involved or how far will the government have to move, so that they can get their way with Accountable Care Organisations (STP, ICS or whatever the current tone is!)? Don’t we owe it to the ordinary person in the street, the people that pay their taxes into a collective and inclusive pot, that we will be striving to establish democratic accountability? Do local authorities and our elected MPs need to start saying that no more imposition and that this is not the ‘only game’ in town?